Welcome To BDM FInancial Services, Inc.
BDM arranges competitive and flexible equipment leases for a broad spectrum of industrial, corporate and commercial clients. The primary advantage of equipment financing is it allows you to acquire assets with a nominal initial expenditure. As equipment financing typically doesn’t require a down payment, there is the benefit of minimally affecting your cash flow. Now you can help your prospective customers overcome obstacles which, previously, could sidetrack a sale, because of hefty down payments and monthly financing costs to concerns with shrinking credit lines. BDM will help you determine which type of lease is best for your business. There are a number of variables that have to be considered; your business type, your plans for the future and how you intend to use the equipment you’re about to acquire or have already acquired. BDM Financial Services will work with you to make sure you get the lease that is right for you. BDM Financial Services recognizes the complexities of the equipment finance market. With a reputation for excellence and 43 year of combined experience, BDM is the sound choice for your equipment leasing needs. 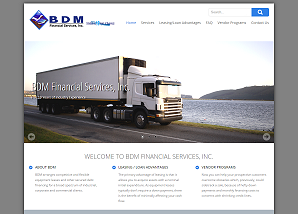 BDM Financial is pleased to announce the launch of our brand new website BDMFinance.com . Compliant with the recent Google guidelines, our website was completely redesigned to be fully accessible and responsive through any computer, laptop, tablet or mobile phone. Our new content and features will make your visit both informative and educational. With a wealth of experience BDM Financial can provide solutions to improve your cash flow, meet your commitments and excel in the marketplace. BDM Financial is an award winning equipment leasing company who is committed to offer the best financing solutions. BDM arranged 5mm funding for two Bell 214ST Helicopters. Award winning California Food distribution company. Financed approximately $3,000,000.00 for expansion of facility. Cooler Dock along with Refrigeration. Company processes, packages, and ships produce in the food service industry. 1.3mm on a new conveyor line. International Electronic Corporation - Major expansion to their Manufacturing Plant existing of High-end machinery $1,200,000.00+ in financing. Copyright © 2018 BDM Financial Services, Inc.